It's almost time for the best day of the year. I'm talking about Thanksgiving. I love it with all my heart. I love the food. I love the togetherness. I love the purpose. And I love how there are absolutely no presents involved. Growing up, we would load up the mini van (or later, hop on a plane), and head west to Chicago. There we would stay at my Grandparents house, and my aunts, uncles, and cousins who lived there would come over. And like the Whos down in Whoville, we would feast, feast, feast, feast! The men would take over the den and TV, the women would be in the living room, usually stitching, and the kids would be camped out in my grandparent's bedroom, watching Charlie Brown, White Christmas, and any other movie we could find in their Beta Disc collection. It was the best day ever. While I am sure it was stressful to have all those people over, I never felt it from my Grandparents. In fact, they seemed in their element. They loved all the family and noise. Every year around this time I love to sit and reminisce. Those memories of Thanksgivings past certainly have a honey glow to them. I hope my kids have the same feeling about the holidays I am trying to create for them. Although, I have married into a family that approaches Thanksgiving quite differently than I do. For example, their stuffing is made from rice. Rice! And they don't like sweet potatoes. Not even my mom's sweet potato casserole with the brown sugar crumble topping. But that's okay. If there is one thing my grandparents showed me, Thanksgiving is about who you spend it with, and being grateful for the people who are missing from around the table. I know I am profoundly grateful for my Zundel grandparents. They are my heroes. This year, I will raise a turkey leg and a prayer of thanksgiving to them. Remember in school how the only thing worse than not having the right thing was getting the right thing and promptly being accused of copying? Apparently it is something that has stuck with me. And it's stupid. Really stupid. It has kept me from doing something I really really want to do. And that, for an adult woman, is stupid. 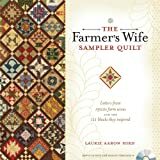 I'm talking about The Farmer's Wife quilt. I bought the book several years ago. I was in the process of choosing fabrics when all of a sudden the internets exploded with all these different quilters making this pretty pretty quilt. And then I got stupid and didn't want to do it because they would think I "copied" them. So my first quilt of 2014 will be my version of the Farmer's Wife quilt. I am pretty excited about it. I am fairly certain I am going to make it lap sized, so I will be omitting some of the 111 blocks. I have an unhealthy obsession with sampler quilts. I love everything about them. So I may even make two versions. We'll see. Lately I can't even finish a chair cushion. I'm anticipating my baby will magically sleep through the night in 2014. Ha. So here is my vow to not be stupid anymore. I am in control of my own life and quilting destiny. And if I want to make the same thing everyone else is making, or wear a shirt that someone I know has, or even cut my hair like someone else, I will. So there. I hate blogging only once a month. I feel really bad about it. But I really don't have much going on right now that is exciting. Or maybe it is. Who knows? Do you find waking up at 3:30 AM to find that your dog has not only pooped all over the upstairs but is also rolling in it exciting? You do? Oh. Me too. So that happened. The end of the story is we cleaned it up and it was gross. I participated in my big craft show of the year last weekend. My mom and I had a blast, and my besties even came for most of the day. I put them to work. We sewed bindings on pencil rolls and had a grand time. Something funny that happened there -- an aisle or two away from us was a table of hand turned pens and seam rippers. Curly heard them joking that they needed to sell "those women sewing" some seam rippers. As. If. My baby now crawls with her belly off the floor and her little tongue poking out of her mouth. It is so cute you might die of you saw it. I signed up for another small craft show at an elementary school for the week after Thanksgiving. Curly rolled his eyes. I think he is tired of craft show prep and wants more laundry prep. Me too. But I also like a crisp $20 bill in my pocket. On a related note, I once heard my cousin say about his wife that she would kill you for 5 bucks. Me? I say make it 10 and you've got a deal. Almost all of my Christmas shopping is done. I was feeling really good about it until I realized that none of the birthday shopping for the two the week before Christmas has been started. Whoops. Curly has to work 6 days this week to get ready for Thanksgiving. I heart retail. Anyway, to make him happy to be home I made homemade cinnamon rolls and organized about 3/4 of his desk at home. Still no laundry. I started the laundry this morning. And lastly, this year I am so excited to celebrate the crap out of Christmas. I am feeling so freakin' jolly. As soon as the Christmas stuff went up in Target, I took my two little girls to marvel. My baby was just as excited as me! But Ginger? She went on a loud angry rant about how it's not even Thanksgiving and where were the Thanksgiving decorations? She got mad at the trees and the lights. This was all in front of the lovely Target employees. It was hilarious, coming from a 3 year old. Then she got over it and started talking about what Santa was going to bring her. We're all jolly! Hello? Is anyone still there? Hi Grandma! This past month has been busy. School and soccer and piano and violin and preschool and baby messes are keeping me on my toes. My goal to shower every day seems a bit lofty now. So here's something I've been a little quiet about. I am on Weight Watchers again. Apparently I'm what's known as a "repeat offender." Funny, no? No. It's not that it's hard, it's just that I would like the metabolism of a much thinner woman. I would also like to be an inch taller. I joined on my birthday and have lost 10 pounds. That's pretty awesome but I still have two chins. I really have been trying to think of losing weight in increments of 10. It seems more manageable to lose 10 pounds at a time. Only 6 times to go! I have started craft show prep in earnest. So far I have just a handful of items to sell. I am doing my usual crayon holders and pencil rolls, plus a few table runners. I am also doing advent calendars and some cute pouches in different sizes. I'll show some progress photos soon-ish. I don't want to over-commit. Hi. It's me. Can you hear me? I'm whispering this post because I am hiding. All my kids are upstairs. I'm not sure what they're doing, but they are quiet. If I move, they will hear me and find me and take away my phone, computer, and tv. They are so mean. Mini-me and Patch go back to school on Monday and I am happy/sad about it. Mostly happy. And broke. Mini-me decided to grow over the summer. That's an expensive hobby. For each shirt I buy, I calculate how much fabric I could have had. It's been a good summer, but mostly it's been experimental. I feel like wearing a badge on Monday that says, "I survived!" And can we talk about baby naps? Holy cow. Sometimes they happen, sometimes they don't. Both are disruptive. Oops, they've found me. These keys are too noisy! Time to sign off. If you don't hear from me in a weeks time, send fat quarters. My first trip to Disneyland was when I was 18. My friend Rachel invited me to come to California for a family event. Problem was, it was the week before finals. I'm a nerd -- studying is my joy. While my parents were visiting for some Spring skiing, Rachel casually mentioned the trip to my mom. For those that know my mom, it will come as no surprise that she looked at me and said, "Oh! Live a little." So I did. And a Disney convert was born. Ever since that trip, I have wanted to take my family there. Honestly, I never thought it would happen. First of all, we are not wealthy. Second of all, we're kinda poor. I will never be able to repay my inlaws for making this dream come true. They have no idea how much it means to me. Or maybe they do. We got to Anaheim on Sunday evening and went straight to Downtown Disney to check things out. The next morning, we got to the park when it opened. We weren't the first people there, but we were close. Upon entering the gates, I cried. It was an ugly cry. And then we saw Donald and I ran my family over to him for a picture. Do you see that crazy look on my face? Yeah, it hasn't been seen since I met the Butlers. We hit the ground running. I sent the kids and Curly on Star Tours and took Ginger and Mavis to meet some Faeries. Ginger wouldn't even look at her. She wouldn't smile for a picture. I thought she was traumatized. But, moments later we were reunited with the rest of the family and guess who couldn't stop talking about Tinkerbell? Turns out Ginger loved it. She wanted to go again. So we did. This time she wouldn't even get in the picture. PS -- Curly told Tink a joke. "What's a fairies favorite candy? Pixie sticks!" So, if you go to Disneyland and Tink tells you that joke, she got it from Curly. PPS -- she was cute as a button. Ginger also wanted to do the teacups. (Sidebar -- who knew she knew so much about Disneyland? Holy cow that girl is a sponge!) I've never seen a smile that big on her. The thing that the kids really wanted to do was Jedi Training. I had read up on it and knew it was kind of crazy, and busy, and that they might not get chosen. Luck was on our side (and maybe some prayers), and Patch, Mini-me, and two of their cousins were chosen. Patch decided he needed to wear the hood. He was so proud of himself, especially when he defeated Darth Vader. Later on, we met Minnie Mouse in her house. Ginger ran up to her and gave her a hug. Flower didn't want to get in the picture because she doesn't like when people dress up and lose sight of reality. I just hate that Mavis was asleep, because this would have made one heck of a Christmas card photo. Tuesday found us over in California Adventure. Lieutenant Shane hightailed it to the Fast Pass line for the Radiator Springs ride, and we got right in line. Long story shortened, Patch and Mini-me got to ride it 3 times. After Cars Land, Curly took Flower on California Screamin', and Aunt Nora and I took the rest of the kids to Disney Jr. Live. It was awesome, right up until the time Ginger shoved a Gold Dablune up her nose. Then we got to go to the most magical place of all --- Disney First Aid! Wednesday was declared Princess Day (by me). We started out with Cinderella. Then Ariel, who Flower sang to. Ginger was really enjoying herself, even though she doesn't look it. As we would leave, she would turn and curtsy to the princess. It was pretty adorable. And then we came upon Sleeping Beauty, who got Ginger to talk. It was awesome. Outside was the wild and crazy princess Merida, and her bear brothers. The brothers were so cool. They would interact with you if you talked to them. Ginger totally ignored Merida and had a grand time with the brothers. And then I got sick with a nasty stomach bug and spent the rest of the day in bed. Seriously, it was terrible. I was so sad to miss our last day there, but they had such a good time. So many aunts and uncles and grandparents to take my kids to see and do things. I am so grateful. Disney magic is unlike any other magic. At one point I felt like shouting a testimony that dreams really do come true! I've gotta sell a lot of quilts so we can go back. We've been home from vacation for a few days now. I feel like I could still sleep for a week. When we vacation, we go all out. No relaxing allowed! This year found us winging our way west to the great state of California. I love California. It is such a glamorous place. For one thing, the palm trees. Am I right? Is there a happier tree than a palm tree? No there is not. For another, the ocean. I love the ocean. Not enough to get in it. I mean, that thing is a giant toilet. But I do love to look at it and sit by it. So here are some photos of part one of our trip: The Kigin Family Reunion. We stayed in Carlsbad, CA. Right on the beach. It was cloudy while we were there, and the surf was a little rough, but we didn't mind a bit. So did Curly and Flower. Curly's cousin Sara loves babies. I hardly held Mavis the entire time we were there. I wish she could have come home with us. My bestie Candice lives close-ish to Carlsbad. I mean, it would seem a lot closer if we didn't sit in 2 hours of traffic. We spent the afternoon eating Mexican food and fabric shopping. It was my idea of heaven. On the way home, Mavis had a wee bit of a meltdown in the backseat. Such a baby. Candice was a good sport, but I think she'll think twice before getting on I-5 with a baby in the back. I was very nervous to let my kids in the water because the the surf advisory. But, Curly promised he was stronger than the ocean. So. Curly's cousin Austin was the Ginger-whisperer. I think she has a bit of a crush. He played with her for a couple of hours on the beach. I wish I could have brought him home, too. I forgot to bring Mavis' swim suit. She was super embarrassed. Patch and his cousin/bestie Wyatt enjoyed being buried in the sand. And Mini-me and Flower were the perfect Beach Beauties. We all were totally fooled by the clouds and got wicked sunburns. Mavis even got one. It was so sad. She was under the umbrella the entire time, but it wasn't keeping the sun off. Curly and his very tall brother helped Cousin Sara do some boogie boarding. Pure joy. Ginger developed Merida hair on the beach. I often came across Patch lounging with his legs crossed. He leads a hard life, so relax he must! Curly's dad's cousin Steve was also a big fan of babies. If Sara didn't have Mavis, then Steve did. With two Kigin cousins to pass around, no one went without a baby for long. We left Carlsbad and had dinner with my Aunt and Uncle. Sadly, no pictures. Only memories. We came in and made ourselves at home. Patch cried at dinner that he was so hungry, but there was no food that he liked. Well, until the chocolate cake came out. Then Mavis had a massive blow out all over Aunt Jill. They were so sad to see us go! And then our Disney adventure began. More on that later. This is, without a doubt, the most anticipated week of our family's year. Yes, I know we had a baby this year. That was pretty awesome. And we're all looking forward to Christmas. But this week, this very week, finally brings us to Disneyland. Let me back up. When Mavis (sorry honey, I just love that nickame for her) was born, my lovely in-laws came out to help over Easter. My mother-in-law, forgetting what children are like, handed each child a page of Disney stickers and told them that in July, we were going to Disneyland. From that day forward, I have hard about Disneyland and princesses and Disneyland and Jedi training and Disneyland and Carsland and Disneyland every. single. day. We saved money in a jar for souvenirs. Let me tell you, earning 50 cents has never been so appealing to my kids. We visited the website and plotted out our ideal days. We watched the Travel Channel's several specials on Disneyland. In short, excitement invaded. And now, it's here. It's finally here. We leave tomorrow morning and 0-dark-thirty. If all goes according to plan, we land in California before lunch. If you want to follow our adventures, then follow me on Instagram. I will be over-insta-ing all week long. I'm "jkigin" and I heart likes, if you're picking up what I'm putting down. I was browsing Pinterest last week like I had extra time on my hands, and came across a tutorial for a flag pillow. (Found here.) So I went up to my LQS, Wexford Dry Goods, picked up some Riley Blake Basics because I obviously didn't have the "right" fabric in my stash, and went. to. town. I finished it in the nick of time. Mine ended up being a lot bigger than the one in the tutorial. Also, I made my HST's a little differently than they did. No matter. I love it. I hung it in my kitchen, but I had to take down one of my favorite prints to do so. I need to find a permanent home for my star hanger, and make some more holiday mini quilts to go on it, preferably before the day of the holiday. I always feel like a genius when I make something cute that other people like. I had a lot of people on Instagram ask for one. I mean, they were all related to me, but that does not diminish the compliment at all. So, I've been busy. Nothing monumental. Just normal, every day busy. For example, I have been doing laundry. That's important for those in my family who enjoy clean clothes. I have also been making dinner and fitting in the occasional shower. Sidebar -- when did bathing become a luxury event in my life? Last month we headed home to spend some time with some friends. We had 11 kids and 3 moms in one house. It was crazy fun. I'm not sure I took a single picture. Then the kids and I went to my parent's house for a few days. That was also a good time. So fun, in fact, that we're going to do it again. Last week, my BFF Lauren and her family came to our house for the holiday weekend. I did take pictures this time! We knew we were in for some fun when the night they arrived, Ginger and Olivia were walking around holding hands. Future besties in the making. We did a lot of fun Pittsburgh-y things. We walked around downtown and went to Point State Park. It's where there's a giant fountain and also where the two impossible to spell rivers merge to become the easier to spell Ohio River. The baby was with us, but she didn't want to be photographed. This is Mini-me and Patch on top of the parking garage. I like to call our city the Europe of Pennsylvania. We visited a couple of Diners, Drive-ins, and Dives restaurants. First up was Kelly-O's, which is less than 10 minutes from our house. Who knew? I had a salad. It was huge. My kids all had pancakes. They were better than McDonald's, and those pancakes are awesome. Then on our date night, we went to Primanti Brothers in Market Square. I ate a sandwich as big as my face. It had cole slaw and french fries on top. Delish. It was so fun. I hope they'll come back. I have two finishes to share. Yay, me! The first is a simple baby quilt for some friends of ours. Curly deemed them "baby quilt worthy" friends, and so I pulled some Quilted Fish fabric and used my new Simply Retro book to find a pattern. It was fast and easy. I did loopy quilting all over it, and then did binding on the bias. In total, I think the quilt took about 4 hours to make. The longest part was the binding. Next up is the quilt for Baby. See here? She's saying how much she loves it. She's also telling me her outfit is too tight. I used another Camille Roskelley pattern. I'm finding there is a fine line between "fan" and "stalker." The fabric is Sarah Jane Studios. I don't know the name of the line, but it's the one with anchors and arctic narwhals. Here is a close up of the quilting. I was very brave on this one. I've had the Angela Walters Free Motion Quilting book since before we moved. I've wanted to try some of the patterns, but I've been so nervous. I didn't want to ruin a quilt. Last week I told myself I was stupid, loaded Baby's quilt on my frame, and went to town with the paisley design. Is it perfect? Absolutely not. But I'll be better on the next one I do. It was fun to try a different style. So there you go. Two baby quilts finished in the past week. I feel pretty awesome about it. This mini features The Quilted Fish' new line, Madhuri. It's 18" square and packs a punch. I was very brave and embraced the bright pink solid. I was really worried it would make my mini look like a hot mess, but it really made it look just plain hot. Here is the back. Love it. And here is the front again. If you want to make one of your own, feel free to use my tutorial. There are a lot of great ones entered this year. Hope you like mine!